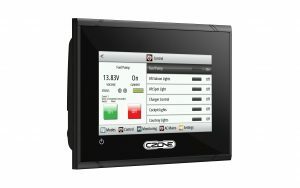 Auckland, August 31 2016 – CZone®, a brand of BEP, the global leader in marine electrical systems and components is proud to announce the launch of the latest model in the range of CZone touchscreen displays, the Touch 5. About BEP Marine: BEP designs and manufactures a range of high quality electrical solutions designed for the harsh Marine and RV environments. Every product it makes meets exacting performance specifications and is designed to withstand extreme conditions both at sea, and on land. As part of the global group Power Products LLC, which includes Marinco, Mastervolt, ProMariner, Blue Sea Systems and Ancor, its product line has expanded to include a broad range of circuit protection, batteries & battery management, power distribution panels, monitors, and digital switching technology. The engineers and product managers at BEP continue to develop the next generation of power management products including the CZone™ and Pro Installer series.